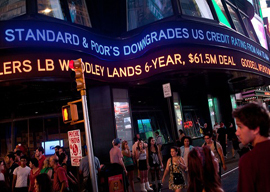 The decision by Standard & Poor’s to strip the United States of its AAA credit rating, for the first time, has triggered a barrage of catcalls against the umpire from the press box and Obamaites. This downgrade is deeply deserved. For no one really believes the United States is going to pay its creditors back the $14 trillion it owes them, or the $21 trillion it will owe them at decade’s end, with dollars of the same value as those that the United States is borrowing today. On “Meet the Press,” Alan Greenspan insisted that the United States is not going to default. Why not? Because our debt is denominated in dollars, and we can print dollars to pay off our creditors. Which is pretty much what Chairman Ben Bernanke and the Fed have been doing. With the dollar down 5 to 10 percent this year alone against the world’s more respected currencies, we are engaged in what the Romans called coin-clipping—official stealing from citizens and foreigners. “I believe this is, without question, the ‘Tea Party downgrade,’” says Sen. John Kerry.